Marathons take place all over the world. If you have not already selected one, then now is the time to do it. Really, do it right now! What have you committed to yourself if you have not already signed up or at least selected the big run (some may not allow you to register yet)? If possible, pick a flat one! If you select one with hills, then make sure you are running hills during your training runs. Some have lots of people and some have far fewer people. There are advantages and disadvantages to both. 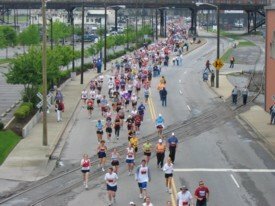 If you select a marathon with a lot of people (perhaps more than 10,000 people), then you can expect some traffic in the beginning, but you will have a lot more fan support and people to run with during the later stages of the marathon. On the other hand, if you run a smaller marathon (perhaps less than 500 people), then you may enjoy little, if any, traffic early on, but find yourself at mile-22 and be all alone with not a runner in site. We all have different preferences. Select the one that is right for you. I suggest selecting an event with lots of people. Why? Because you have more people to run with and support you (and you support them) when you need it most. If there is traffic early on, who cares? You are not trying to break a world record! Your goal is to successfully train for and finish a marathon. You will need all the help you can get. Consider getting your name printed on your shirt. Strangers will cheer you on! Why do I care about strangers? You will! Again, you will need all the help you can get. Have fun! While supporters cheer for their friends or loved ones, they also understand the accomplishment you are striving to achieve. Hear them shout your name. Feel like you are a celebrity. See yourself seeing the finish line. See yourself crossing the finish line. Feel what it will feel like to cross the finish line. When you select YOUR marathon, get a map of the course. Contact the management of the course to find out the best place for your friends or family to see you. Do not just look at the map and say, “See you at mile 5, 17, 21, and 26.2.” These areas may not be accessible to spectators. Do not just assume they can get to those points. They may not! Speaking from experience, it is a major disappointment to expect to see your supporters at a specific point and they are not there when you get there. While you know they want to be there, you also know they cannot be there. Plan ahead! Let your supporters know where they can see you. They will give you a major emotional lift when you see them. If you do not see them? Well, you can expect the opposite effect. Trust me, I know! Consider wearing something bright. You do not want your supporters to be at the expected spot and not be able to see you! I am not suggesting this, but during my first marathon, I recall seeing a hairy guy sporting a pink tutu and pink cowboy hat. Again, you would never see me wearing that, but the point is to wear something that stands out so your supporters can easily pick you out in a group of runners. If you will not have personal supporters to cheer you on, then I highly recommend getting your name on your shirt. The lift you will get will be amazing and make the marathon fun for you as total strangers cheer you on. Pick YOUR course, make sure your supporters know where they can see you, make sure they CAN see you, and get support from strangers. You will need it! To view a list of marathons, check out the Marathon Directory. Want to learn more? Marathon Rookie: How to Train for a Marathon...and have fun doing it! is a fun to digest, inspiring book that teaches you everything you need to know to enjoy training and cross the finish line for the first time.